MO: have you guys seen or heard anything about Suzuki's new 250? There's been a few mentions of it on other sites. In the UK, Suzuki calls it the Inazuma and claims it puts out 24hp and 29.5 ft-lb. Fuel consumption is said to be 85 miles per UK gallon which works out to about 70 mpg in US measurements. US pricing has yet to be announced, but we hope it will be under $5000 if Suzuki hopes to stand a chance against Honda and Kawasaki's offerings. In the UK, it's priced about $882 lower than the Honda CBR250R, but we'll have to see when American Suzuki announces its price. It's manufactured in China which we hope would help keep costs down. Made in China? I didn't see that fact elsewhere. I guess China is Suzuki's answer to Honda's Thailand plant. It looks like a mini B-King! Yes, China. That's where it was first introduced earlier this year. 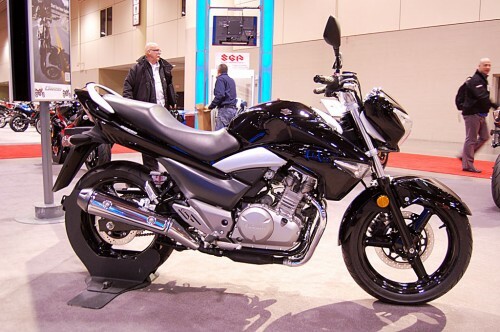 I took a look at the GW250 at the Toronto Motorcycle Show which was the same weekend as the Long Beach IMS. How did it look "fit and finish" wise, especially compared to the CB250R and the new Ninja 300? I was down at the local super-dealer yesterday getting a part, and they had the new 300 on the floor. I was really impressed at how improved it was over the previous version. And they had 4 or 5 variations of the CB250R, including a Repsol version that was really trick. It's enough to make me wish I was a 16 y/o with some Israel bonds burning a hole in my pocket! Geez look at that picture. Yeah, that's kind of where I was going with my question. If it really does "look Chinese" they're wasting their time trying to sell them at $4k. Nobody would pass on the CBR or the Ninja at the same price for a bike like that. Not to mention Suzuki's own SV650 is only a couple grand more. I think the Chinese have a huge percieved quality gap to overcome before they have any success with higher end products here. Much like the "Jap" junk of the 50's and 60's or Korean Crap of the 80's and 90's, both of which are now synonymous with high quality. The Chinese are certainly capable of it, time will tell if they have the impetus to try or are satisfied with mid range to low range quality goods. 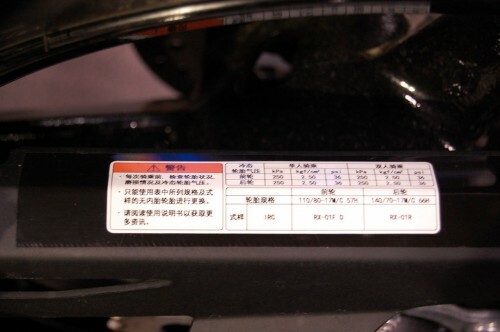 China needs their own "CB 750." IMO, that motorcycle was an epiphany that altered the American perception of Japanese products. Obviously products that followed from Toyota, Datsun, and various electronics manufacturers carried the momentum forward as well. Don't forget though that it's a motorcycle made in China, but it's still a Suzuki. It's a notable difference between the GW250 and a similar product built in China by a Chinese manufacturer. It's like the difference between a made-in-China Apple iPad and an tablet produced by a Chinese manufacturer. The product still has to meet the manufacturer's own quality standards.